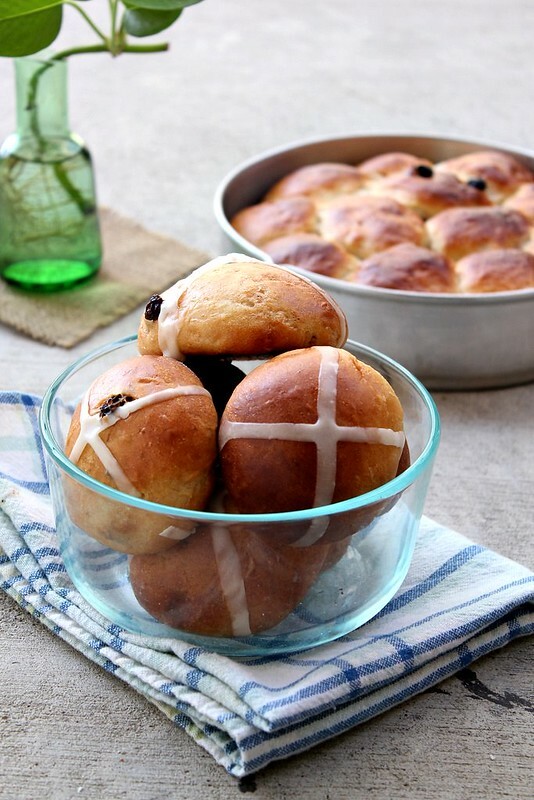 It's only a few months ago did I realise that people ate Hot Cross Buns on Good Friday. 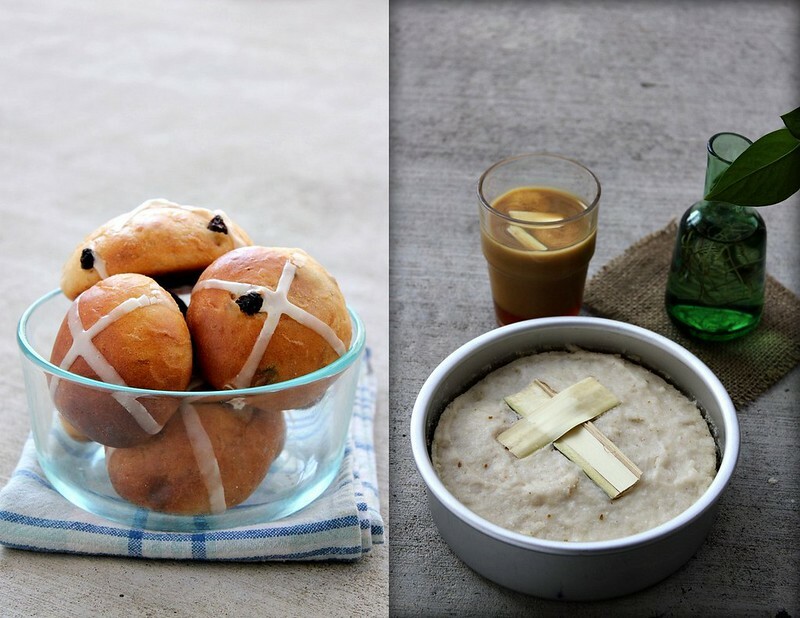 I thought it was for Maundy Thursday as we break bread at church and at home. I am not a big fan of the traditional unleavened passover bread I.N.R.I. 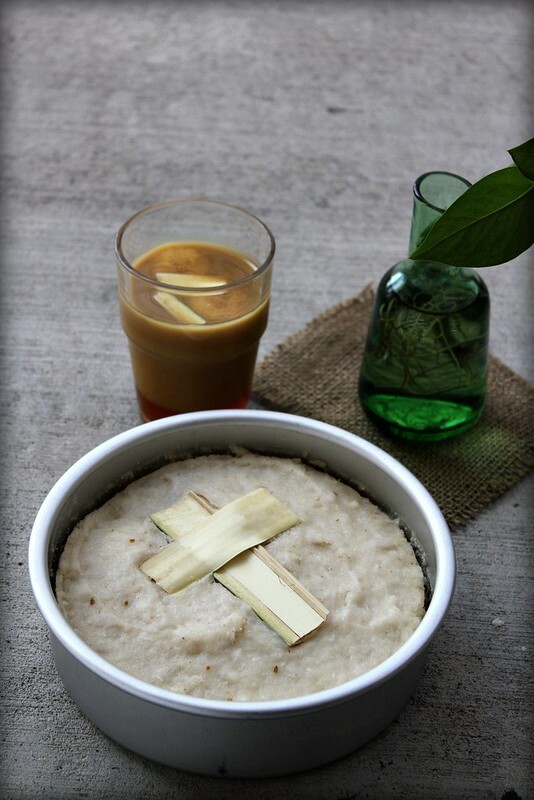 appam/ Indriappam, we Catholics make in our homes (in Kerala) on Maundy Thursday. I was proved wrong when I tasted the Indriappams they served in our Cathedral in Kannur. 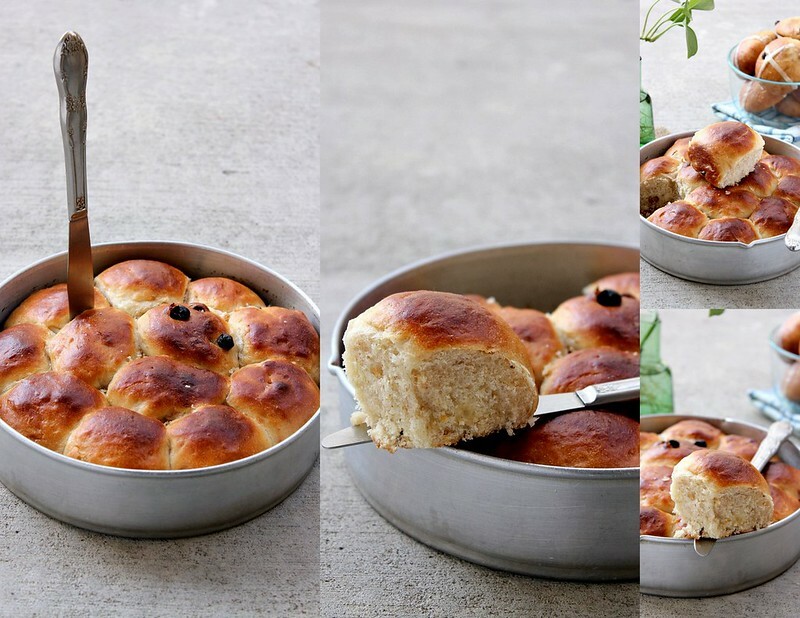 It was really good, filled with grated coconut.Till that year, Amma used to buy hot cross buns from the local bakery and serve it with Pesaha Paal. She didn't want Indriappam to be wasted as no one would like to eat it the next day even though we drink Pesaha Paal like Payasam till it's over. But this year, Jobin asked me if I could make a small Indriappam just for the two of us. Of course, I obliged but the thought of not having buns with the Pesaha Paal haunted me. Big deal! I'll make both! I remember seeing a recipe on Pioneer Woman's website a few years ago and thought of making that one because whatever I've tried so far from her blog never failed me. I'm not the one who fears yeast because I was never made to fear one! Amma bakes with yeast like there's no tomorrow and everytime I was there next to her she used to chant the mantra,'Make sure you use yeast which is still fresh. Always check for the expiration date'. 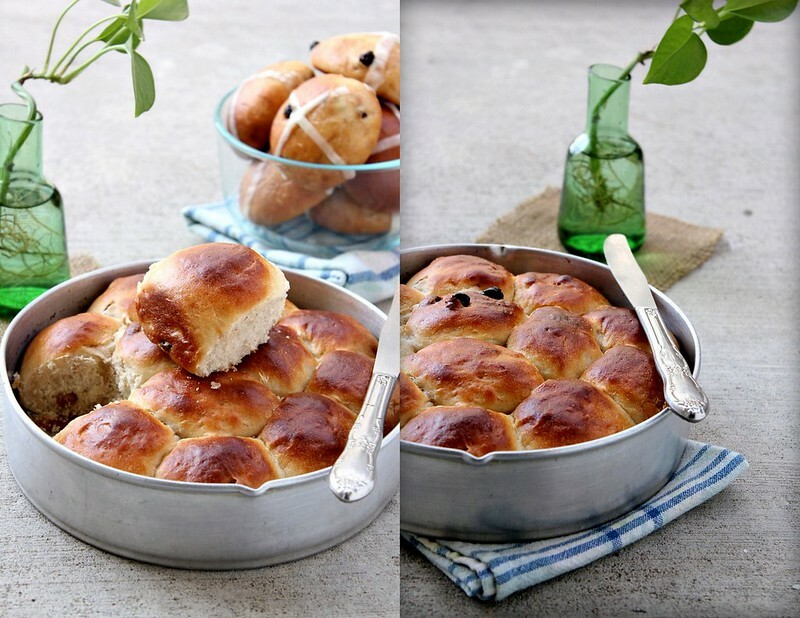 So the silky soft dough was made and then sprinkled with spiced sugar, raisins and rolled into small buns. They were left to rise and that's exactly when he called and told me he's on his way home. He reached home while the buns were baking and when I was in the Cinnamon haven! I was never a fan of Cinnamon and it worsened after moving to the United States. Now, after living here for sometime and eating the best possible Cinnamon Rolls from Tobies, I'm in love with Cinnamon. Method: In a big pot, scald the milk along with oil and sugar. Leave it aside for 30 mins. Add yeast, 4 cups of flour and mix well. Cover it with a tea towel and let it rise for 30 mins. Add the remaining 1/2 c flour, baking soda, baking powder & salt. Mix well and dump the dough onto a lightly floured surface. Pat it out lightly with your finger.Mix the sugar with the ground spices and sprinkle 1/3rd of it over the dough.Sprinkle some raisins over it. Fold the dough from 4 sides so that the raisins and sugar is inside the fold. Repeat the process twice more till the raisins are over. You may not use all of the spiced sugar. 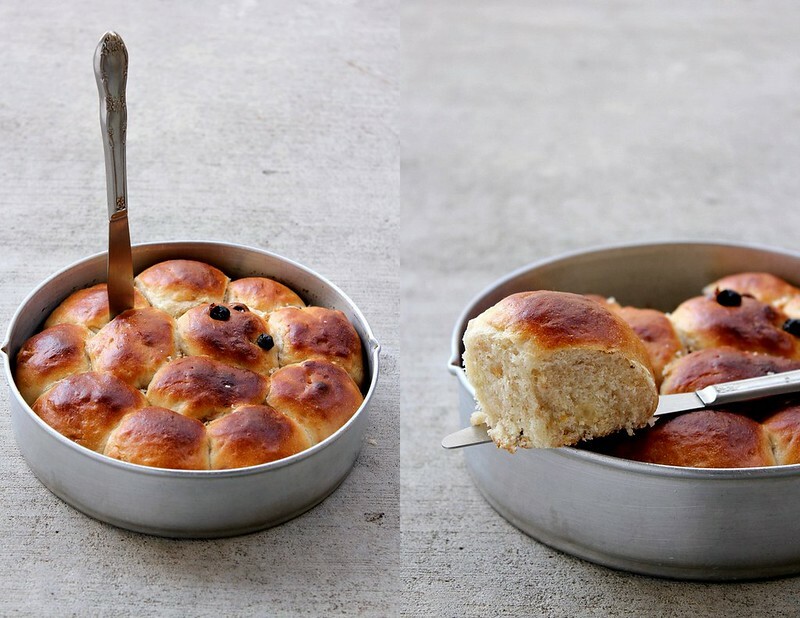 Pull out small balls of dough and roll them into small buns. Place them on a lightly greased baking/cookie sheet and let rise, covered with a tea towel for 1 hour. Brush them with a glaze made using egg white beaten with milk. Pre-heat the oven to 400F and bake the buns for 18-20 mins or until the top is golden brown. Remove from the oven and cool completely. Once cooled, frost them with egg white beaten with powdered sugar & thinned with milk if needed. It should be a thick frosting so that it doesn't drip away from the buns. Method: Soak urad dal in 1/2 c water for an hour. Grind it to a smooth paste with a teaspoon or two of water. Grind the coconut, cumin, pearl onion and garlic to a smooth paste using very little water.Bring 1 1/4 c water to a rolling boil and add the rice flour to it. Switch off the heat & stir well to mix. Add the ground coconut & urad dal to it and mix well. The batter should be of an Idli batter consistency. 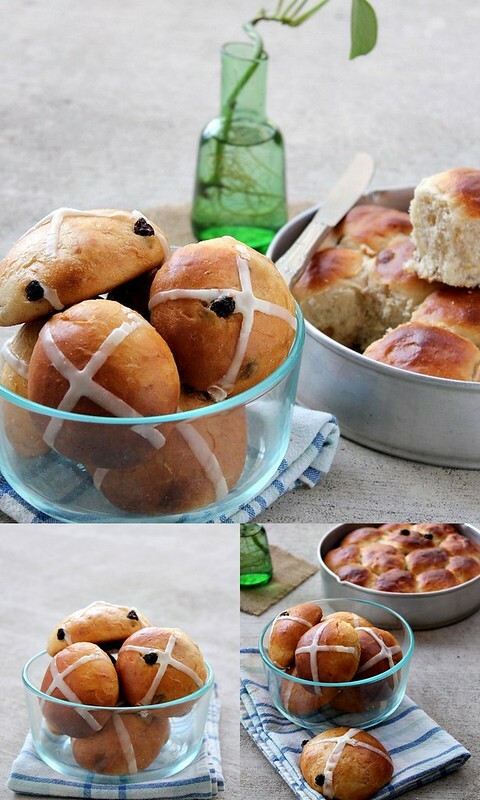 Pour into a greased tin, place a cross with the palm,cover with foil and steam for 25-30 mins on medium high heat. Tell me, how are you all celebrating this weekend? Any plans? 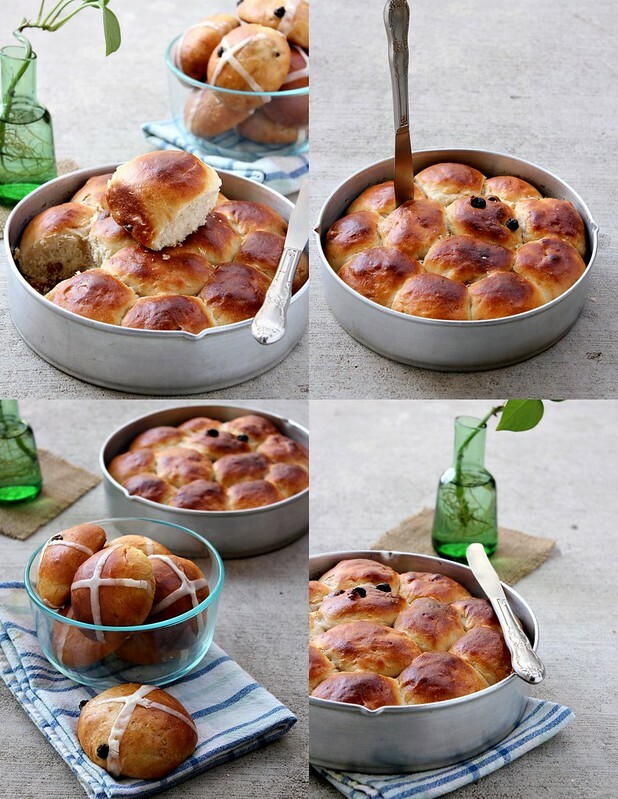 These Hot Cross Buns are Yeastspotted! We call it 'pulikkatha appam' which means, we don't let it ferment even for a few mins. It is not hard if made correctly yet not soft like vattayappam. This is the way it's meant to be (for us),infact the directions are 'steam the batter as soon as it is made'.